This NASA view combines two images from NASA's Solar Dynamics Observatory captured on Jan. 7, 2014. Together, the images show the location of a giant sunspot group on the sun, and the position of an X-class flare that erupted at 1:32 p.m. EST. 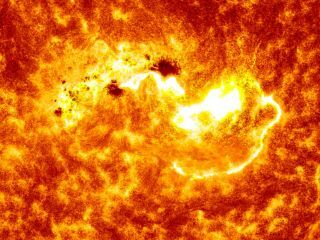 A massive solar flare erupted from the sun on Tuesday (Jan. 7), rising up from what appears to be one of the largest sunspot groups seen on the star's surface in a decade, NASA officials say. NASA's Solar Dynamics Observatory captured a video of the huge solar flare as it developed, showing it as an intense burst of radiation from a colossal sunspot region known as AR1944. The sunspot group — which is currently in the middle of the sun as viewed from Earth — is "one of the largest sunspots seen in the last 10 years," NASA officials wrote in a statement. It is as wide as seven Earths, they added. This labeled image taken by SDO's Helioseismic and Magnetic Imager shows the location of two active regions on the sun, labeled AR1944 and AR1943, which straddle a giant sunspot complex. A Jan. 7, 2014, X1.2-class flare emanated from an area closer to AR1943. When aimed directly at Earth, the strongest X-class solar flares can pose a risk to astronauts in orbit and interrupt communications and navigation satellite operations. Tuesday's solar flare did force the commercial spaceflight company Orbital Sciences to delay the launch of its first Cygnus cargo mission to the International Space Station from NASA's Wallops Flight Facility on Wallops Island, Va.
NASA officials told SPACE.com today that the crew of the International Space Station will not have to take measures to shelter themselves from the solar flare's radiation effects. There are currently six astronauts living on the station as part of the outpost's Expedition 38 crew. The team includes three Russian cosmonauts, two NASA astronauts and one Japanese astronaut. The sun is currently in an active phase of its 11-year solar cycle. The current cycle, called Solar Cycle 24, began in 2008. Editor's Note: This story was updated at 9:26 a.m. EST to include new details about the effects of the solar flare for astronauts on the International Space Station and its delay of an Orbital Sciences Cygnus cargo mission to the station from Wallops Island, Va.